Protection of national economic projects from possible effects of catastrophes as well as the geological environment control in the operation of industrial facilities involves geodynamic objects monitoring. The paper deals with the identification of karst geodynamic objects by means of geophysical methods. Resistance method is chosen as the main one. The method has some modifications such as the electric profiling and the electric sounding. The modification choice depends on the tasks, areas and conditions under sounding. The paper also deals with the physical basis of the resistance method and initial results obtained by electrical profiling and electric sounding. The nature of the relationship between the apparent resistivity and the geological section structure is illustrated in graphs. The electrical sounding curves type dependence on the parameters ratio of geoelectric section layers is determined. Keywords: electric sounding, karst process, geoelectric section, geodynamic object. Kuzichkin O.R. Programmno-apparatnaja organizacija jelektrolokacionnyh sistem pri geomonitoringe karsta [Hardware and software electro location systems at geomonitoring karst] // Proektirovanie i tehnologija jelektronnyh sredstv [Design and technology of electronic means], 2006, vol. 4. – P 54-58. Lisitcin V.V. Rekomendacii po geofizicheskomu issledovaniju zakarstovannosti territorij, prednaznachennyh dlja stroitel’stva [Recommendations of geophysics research of karst areas designated for construction]. – Moscow, 1971. Dobrokhotova I.A., K.V. Novikov Jelektrorazvedka. 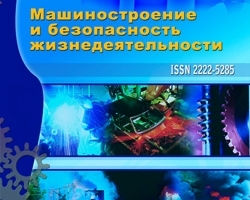 Uchebnoe posobie [Electromagnetics. Textbook]. – Moscow, SGU, 2009. – 55 p.
Orekhov A.A., Dorofeev N.V. Organizacionnaja struktura geojekologicheskogo monitoringa geodinamicheskih ob#ektov [The organizational structure of geoecological monitoring of geodynamic objects] // Tehnologii tehnosfernoj bezopasnosti [Technology of Technosphere Security], 2012, № 4 (44). – P. 1-4.